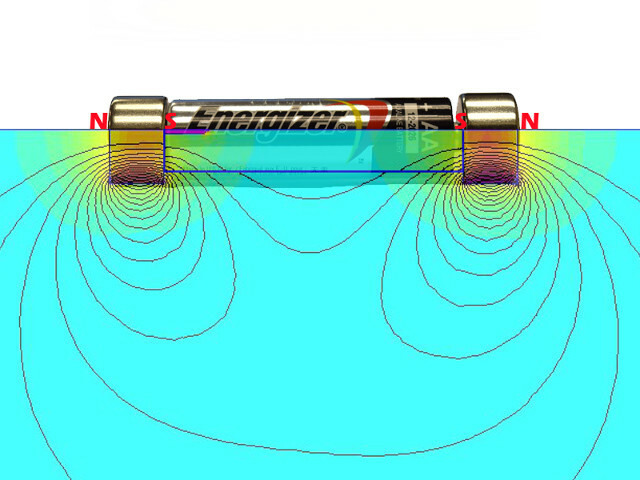 Here's another neat demonstration of magnets set in motion with a simple AA battery. It's a great science demo that attracts attention whether in the classroom or at home. It works on the same principles described in our earlier Magnet Car and Homopolar Motor articles. This popular magnetic train demonstration has been making the rounds on YouTube. Two magnets stuck on either end of a AA battery running through a coil of copper wire makes a fast-moving train! Check it out! 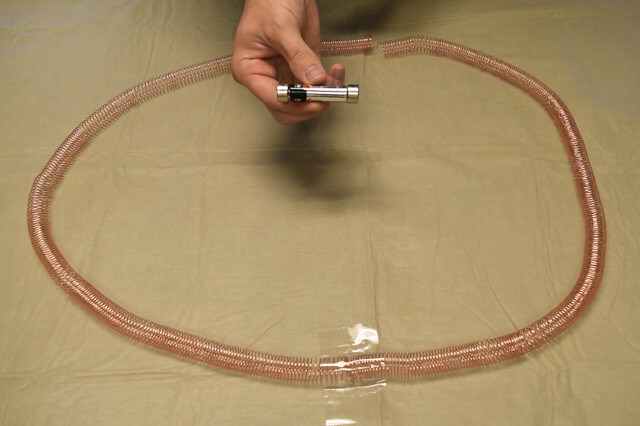 The track is a coil of copper wire, wound so that the inside diameter is a bit bigger than your train. You must use un-insulated wire for this. Insulated wire or Magnet wire will NOT work. Don't buy Magnet Wire for this trick. 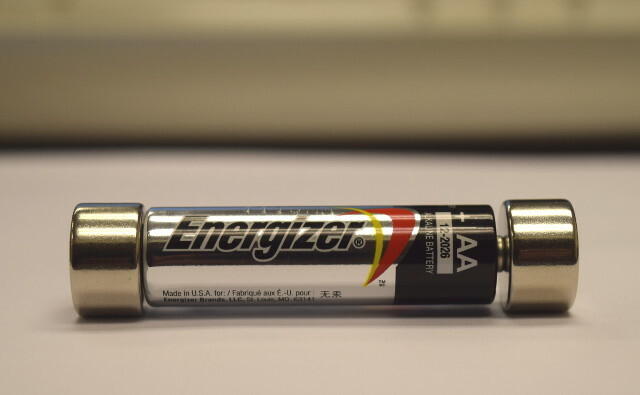 The train consists of a fresh AA battery with a magnet on each end. The orientation is important; you don't want both magnets facing the same way. In this video, we show a few minutes of the magnet train demos we tried. We tried various tracks, batteries and magnets, and even a train jump! When the magnets touch the copper wire, an electrical connection is made. When both magnets touch the wire, a fairly short length of copper wire is conducting electricity from one end to the other. It's really short-circuiting the battery! The high current induces a magnetic field inside the coil of wire. With the way the magnets are arranged, the induced magnetic field pushes on the magnets, repelling them. Why do the magnets have to be arranged that way? There's a wonderful explanation found in this video. It's by YouTuber Physics Girl, whose awesome channel is a great collection of science demos and explanations. Her video inspired us to try this ourselves in the first place! For a very short length of wire, we were able to wind copper wire around a wood dowel rod by hand. For longer lengths, we needed some mechanical help to make the process less tedious and more accurate. 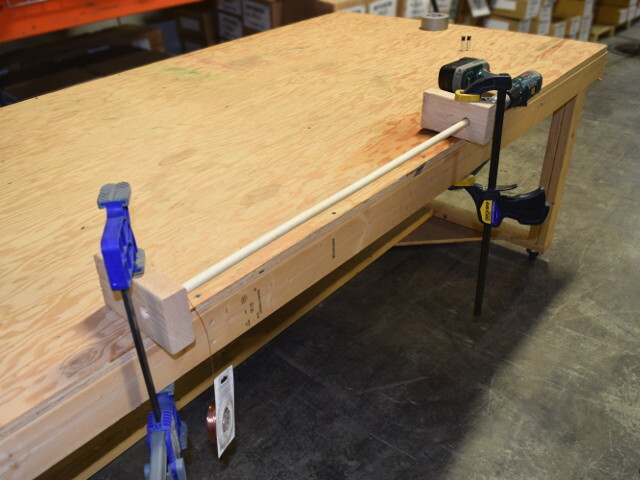 The video below shows how we attached a wood rod to the end of an electric drill to wind the wire. The wood rod we used was 5/8" in diameter. After releasing the wire from the wood rod, it relaxed a bit to a slightly larger size. This allowed the 5/8" diameter magnets (and slightly smaller battery) to slide through nicely. What magnets should be used to make these trains? Many sizes might work, not just the few we demonstrated. The key is to pick magnets that are a bit larger in diameter than the battery. This ensures the magnets will make contact with the copper wire. Most of our demonstrations used 5/8" diameter x 3/8" thick DA6 disc magnets with a AA battery. Enjoy your own train demos, and stay on track!